With the advent of technology, the world has become much more transparent. As information is now available at the tip of the finger, people have got a handful of tools to know the happening around him. Cinema being one of the most popular art is liked irrespective of any particular generation. Right from the shooting location, through the social media sites, news, photos and making videos reach the people in a fraction of second. Just from the announcement of a project, youngsters keep a close eye on it updated information. As the social media has become more user friendly, the young educated movie goers shares their thoughts and views which even can influence the making of the project. The first half of 2014 has seen the release of 91 movies (81 malayalam, 10 dubbed) with just 6 movies could win the heart of the spectators. As per report, there had been a loss of 150 crores giving less chance for producers to invest money in new ventures. Much hyped multi star projects disastrously failed in the box office while the sensible viewers gave full support to those projects which had freshness to keep them intact in the theatres. So what are the criteria of tagging a movie as most anticipated or most awaited? Is it the star cast or the cost of the movie? Having a close look at the making of the upcoming projects, here are the top 10 most anticipated malayalam movies which are gearing up to reach theatres. Made with a mammoth budget, Peruzhazhi is the most anticipated malayalam movie which is currently under the post production stage. Just from the announcement of the project, it created a state of curiosity among the online users for its huge star cast. Planned to reach theatres during the Onam season, Peruzhazhi is expected to fetch family audience who love to sit relaxed and watch the fun filled movie. Written and directed by Arun Vaidyanathan stars Mohanlal, Mukesh, Vijay Babu, Aju Varghese, Ragini Nandwani, Sandra Thomas, Shankar Ramakrishnan, Baburaj and Delhi Ganesh in prominent roles. Touted as a political thriller, the movie is themed around two close friends who are bitter political rival at the same time too. The movie speaks on similarities between the politics of India and the US, the two largest democracies of the world, in a humorous way. Manglish directed by Salam Bappu featuring Mammootty in lead is another most anticipated movie of the year. The story revolves in and around Malik Bhai, born on an ordinary muslim family. Caroline Beck, P Balachandran, Tini Tom, Vinay Forrt, Sudheer Karamana and Srinta will also be seen in important roles. Creamed with humour, 'Manglish' is tight packed with a thrilling theme which will keep the audience intact. Scripted by K P Riyas, the movie is being produced by Muhammed Haneef under the banner of Red Rose creations. A peppy song sung by Dulquer Salmaan is a special attraction. 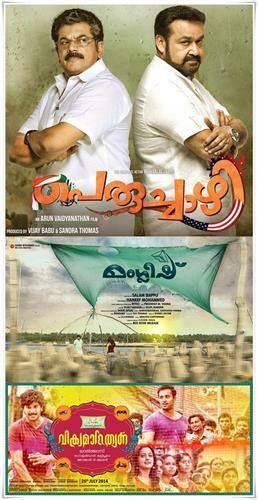 Vikramadithyan directed and produced by Lal Jose featuring Dulquer Salmaan, Unni Mukundan and Namitha Pramod in the lead roles would reach theatres on 25th July 2014. The story of the movie revolves around the friendship between Vikraman (Unni Mukundan) and Adithyan (Dulquar Salman) who were born on the same day. As a girl named Deepika (Namitha Pramod) enters their life, things takes a thriving shift. Nivin Pauly also appears in a guest role. The songs of the movie have already become popular among the music lovers. Anoop Menon, Charmila, Lena, Sidhartha Siva and Joy Mathew will give life to other prominent roles. Sapthamashri Thaskara directed by Anil Radhakrishna Menon is one of the most awaited movie of the year. With a huge star cast including Prithviraj and Asif Ali, the movie is all about the story of 7 gentlemen thieves. This comedy flick will have all elements to entertain the movie enthusiasts. Helmed by national award winner Anil Radhakrishna Menon, the movie also features Nedumudi Venu, Reenu Mathews, Sanusha, Neeraj Madhav, Chemban Vinod and Flower Battsetseg in important roles. Sapthamashri Thaskara is produced by Prithviraj himself along with director Santosh Sivan and entrepreneur Shaji Natesan under August Cinemas. Made with a budget of 10 Crores, the movie would reach theatres on 8th August 2014. Laila O Lailaa is yet another project which has generated curiosity must before its shooting. 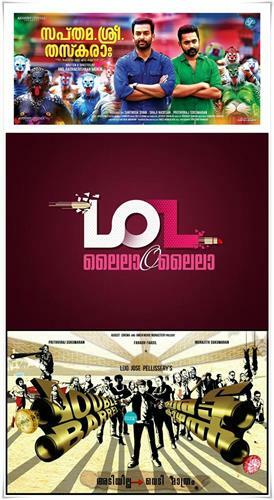 This comedy thriller to be directed by Joshiy featuring Mohanlal and Amala Paul is scripted by Suresh Nair. He is much known for being the scribe of bollywood hits Namstey London, Kahaani and D –Day. The movie is produced by Finecut Entertainments and expected to be released in 2014. Tamil actor Sathyaraj will also give to a prominent character. Earlier 'Run Baby Run' featuring the same team was a grand success in the box office. Double Barrel is yet another multi starrer movie directed by Lijo Jose Pellissery. Touted as an action comedy thriller, the movie features Prithviraj, Fahadh Faasil and Indrajith in lead roles. Jointly produced by August Cinema India Pvt Ltd and Amen Movie Monastery, 'Double Barrel' will be blessed with the presence of Sreenath Bhasi, Shine Tom Chacko, Rajeev, Way Babu and Rachana Narayanankutty, Swati Reddy and Sheetal Menon. Set in the backdrops of Goa, the movie will have very unusual automobiles settings. The costumes to be used in the movie will be of Brazilian style while the make-up would be totally different from head to toe. Double Barrel is said to be a wacky comedy entertainer which would follow the style of 'Quentin Tarantino'. Iyobinte Pusthakam directed by Amal Neerad will have Fahadh Faasil, Lal, Isha Sherwani, Padmapriya and Reenu Mathews in lead roles. Based on the 'Book of Job 'in the old testament of Bible, Iyobinte Pusthakam is a periodic movie which deals with the socio-political issues which happened during 1910-1970. The story and script are penned by Gopan Chidambaram and dialogues by Shyam Pushkaran. The movie is produced by Fahad and Amal Neeran under the banner Amal Neerad Productions. The visual treat would reach theatres during this Onam. Lena, T G Ravi, Sreejith Ravi, Jinu Jose, Chemban Vinod, Vinayan, Saritha Kukku, Anil Murali, John Vijay are also in the star cast. Little Superman 3D which has created news while during its making would reach theatres by September. Directed by Vinayan, the movie features Master Denny and Baby Nayanthara in lead roles. Renjith, Madhu, Shammi Thillakan, Krisha, Praveen will also be seen in prominent roles. It is known that the producers have spent 2 Crores only for graphics to meet the international standard. This magnum opus fantasy movie will be released in Malayalam, Tamil, Telugu and English languages. The movie is themed around a 12 year old boy Villi who search for the murderers of his parents. Ansiba Hassan will be seen as his sister in this movie. The cinematography is handled by K G Ratheesh. Mili featuring Amala Paul and Nivin Pauly in lead is directed by Rajesh Pillai.The movie is blessed with the presence of Gopi Sundar and Shaan Rahman who would render tunes for the lyrics. The story revolves around the life of a girl named Mili who overcomes setbacks through self –discovery and self belief. Mili who lives with a lot of convolutions has an inferior belief about her look. She later realizes the internal potential and finds ways to survive in this world. Otta Mandaram, made with a limited budget is a real life story which happened in Andhra Pradesh. Directed by Rajesh Mankara, the movie tells the movie visualizes the anguish of a 15 year old young girl Kala. Bhama plays the role of 'Kala', a 15 year old girl. Nedumudi Venu, Kochu Preman, Narayan Nair, Kulappulli Leela, Kozhikode Sharadha, Rugmini Amma, Lishoy, Sabu Thiruvalla, Satheesh Vettikavala, Aswathy Nair and Sreekutty have also played prominent roles. Kala had to bear the pain of a mother while turning into a widow at a very young age. Pregnancy and melancholy destroyed her presence of mind and forced her to settle in one corner of the house. Her fight back for the survival forms the crux of the movie. Even though the names of anticipated movies can be further listed, it is little difficult to mention more. Other upcoming projects include Puli Murukan, Rajadi Raja, Amar Akbar Antony, Enthoru Bhagyam, Hai I am Tony, Money Ratnam and many more.